I havent been stamping much, except for Friday Mashup, but there is a new sketch blog out there that brought me out of my slump today. If you havent heard of it yet go check out Freshly Made Sketches. I always need some inspiration when it comes to layouts and since I've become disillusioned with quite a few other sketch challenges its nice to see a new, "fresh" one out there! For the sketch this week I went with a fall image, since we're well into autumn here in southcentral Alaska. I used a retired set, as its one of my favorites, as well as some retired DSP that I've been hoarding. I paper pieced the images, with a bit of the blender pen used on some of the images also. Thanks for looking, and make sure you go check out the challenge! Sigh. I have that stamp set on my wishlist of retired ones. It is such a great set and you did an amazing job showcasing it. 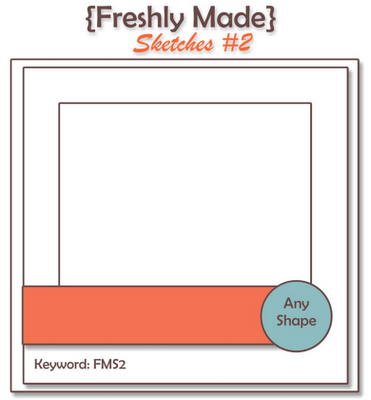 Thanks for joining us at Freshly Made Sketches this week. Great job coloring that stamp! Absolutely perfect for autumn! Thanks for joining us at Freshly Made Sketches. So glad we could help you out of your slump! Great colours Lisa! I am so happy you played along with us! I love your work! Thanks for joining us at Freshly Made Sketches! Adorable fall card, Lisa! I love the image! Thanks for joining us at Freshly Made Sketches! What a lovely card Lisa ... the colours you have used a beautiful and your focal image fits just perfectly!!! Love that DSP background, definitely worth saving some retired DSP for later! The colors are just so evocative of fall and your card certainly does feel like fall.